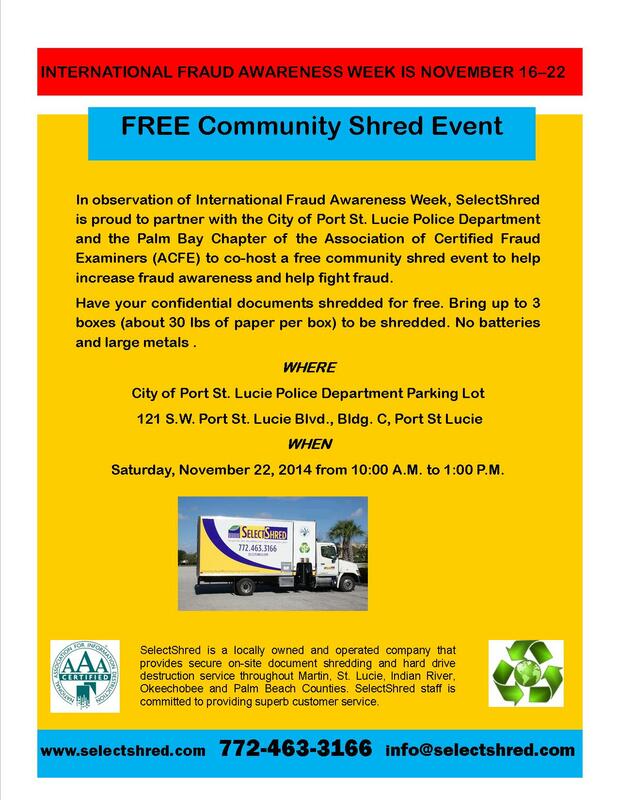 SelectShred will observe International Fraud Awareness Week by joining the City of Port St. Lucie Police Department and the Palm Bay Chapter of the Association of Certified Fraud Examiners (ACFE) to co-host a free community shred event to help increase fraud awareness. International Fraud Awareness Week was established by the ACFE to encourage business leaders and employees to take steps to minimize the impact of fraud by promoting awareness and education. The goal of ACFE is to serve the community by promoting fraud awareness. A common fact about fraud is that organizations worldwide lose an estimated 5 percent of their annual revenues to fraud. 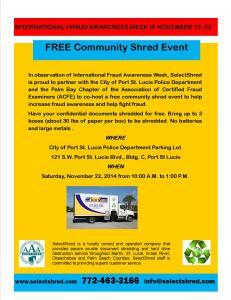 A free community shred event is a great public service opportunity to promote the awareness of fraud and identity theft, as well as the importance of shredding to keep your sensitive information from getting into the wrong hands. Our goal is always to go beyond a free shred day to educating you for the future. The shred event is an opportunity to learn about a NAID AAA Certified document destruction company and the role it can play in helping individuals and businesses fight fraud, prevent identity theft and information security breaches. SelectShred is a locally owned and operated independent mobile document destruction company providing secure on-site document shredding and on-site hard drive destruction service for business, professional, medical, and residential communities in Martin, St. Lucie, Indian River, Palm Beach, and Okeechobee Counties. We provide a service that combats fraud by helping to fight identity theft, safeguard confidential information, protect consumer privacy, and secure trade secrets and proprietary information. As an opportunity to renew your commitment to preventing and detecting fraud, follow the link to ACFE INSIGHTS and read How Will You Observe Fraud Week? SELECTSHRED DOES SHREDDING ON THE TREASURE COAST, INCLUDING SHREDDING IN STUART, SHREDDING IN PALM CITY, SHREDDING IN PORT ST LUCIE, SHREDDING IN FORT PIERCE, SHREDDING IN HOBE SOUND, AND SHREDDING IN PALM BEACH.